What a beautiful necklace! That sounds like a great read!!! UMM. DOES BEING THE AUTHOR DISQUALIFY ME FROM ENTERING?? I love this! Awww, this necklace is lovely – thanks for the chance! It’s so pretty! Thank you for the giveaway! Thanks so much for the giveaway! The necklace is beautiful. Thank you for this delightfully sparkling give away! +1 I like the Harry Potter Lightning Bolt Charm Necklace. Looks great! Thank you for the chance to win! I can’t wait for Supernaturally! yay!! want this so bad!! Nice post this one..and well thinking of posted here..and too cute that picture..thanks for sharing here with us.. So beautiful. I love the book tie in for the necklace. I adore this sweet necklace! Please enter me in! My favorite item is Itty Bitty Compass Charm Necklace in Antique Pewter with a Delicate 18 Inch Silver Plated Cable Chain – so cute. What a gorgeous pendant! Thanks for an awesome giveaway! +1 I favorited her Etsy shop (LifesSweetPassions). +1 My favorite item is the tiny pine cone pendant. +1 I follow Fire and Ice on Twitter (@ReadingFever). +1 I follow Kiersten White on Twitter (@ReadingFever). 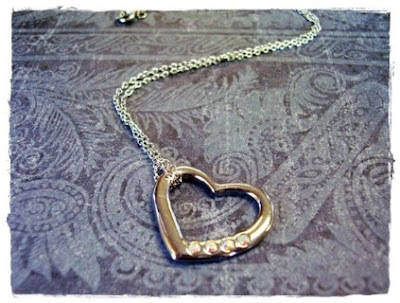 Love the Evie necklace, so simple but chic!